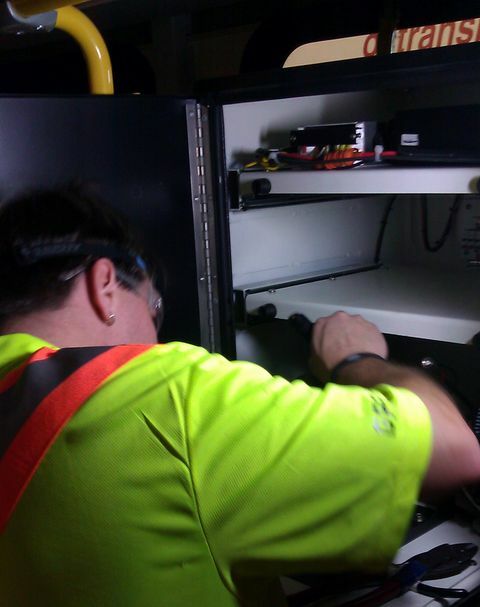 Here we see crew chief Scott hard at work installing one of the hundreds of Clever Devices Smart Bus hardware packages for OC Transpo (Public Bus System in Ottawa Ontario Canada) GPS to GO has been so fortunate to be involved in. On September 9, 2009, OC Transpo was showcasing the automated announcing devices made by Clever Devices. Note that the camera-person is Steve Fischer of CBC News Ottawa.